There’s Eco, which garners the highest gas mileage at the cost of power, Comfort, which is the middle ground of handling, power and ride, and Sport, which firms the steering and pumps up the power. That was great for accelerating onto the highway or away from a crowded traffic light when a lane change was in order. But the Limited also offers Smart, which is the best of all worlds. Why? Its smart little computer chip reads how the driver is responding and adjusts the car accordingly. Be the aggressive driver that’s heavy on the accelerator and Smart realizes that, and holds the lower gears a little longer for a faster getaway. Cruise a neighborhood at modest speeds and light acceleration and it adjusts to a fuel-saving mode. Clever! 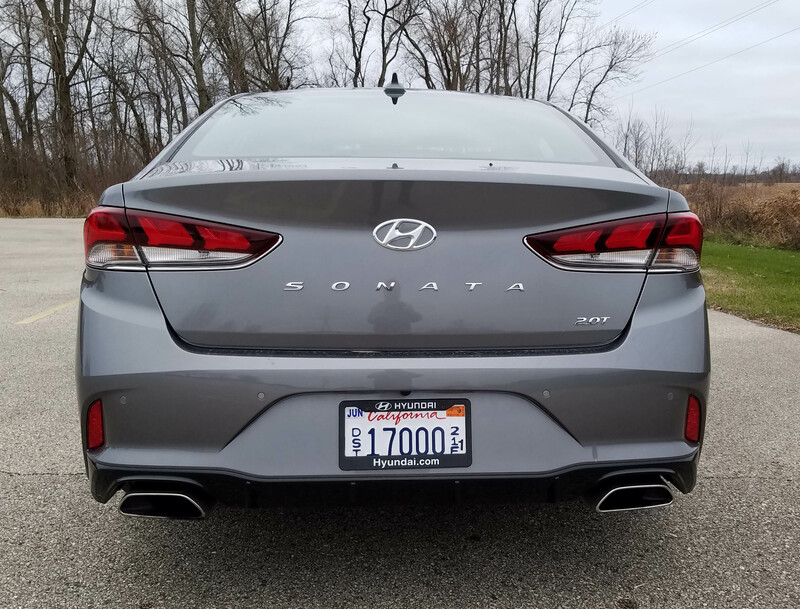 I’m closer to that aggressive driver than I’d like to admit and the sporty nature of this Sonata sold me. 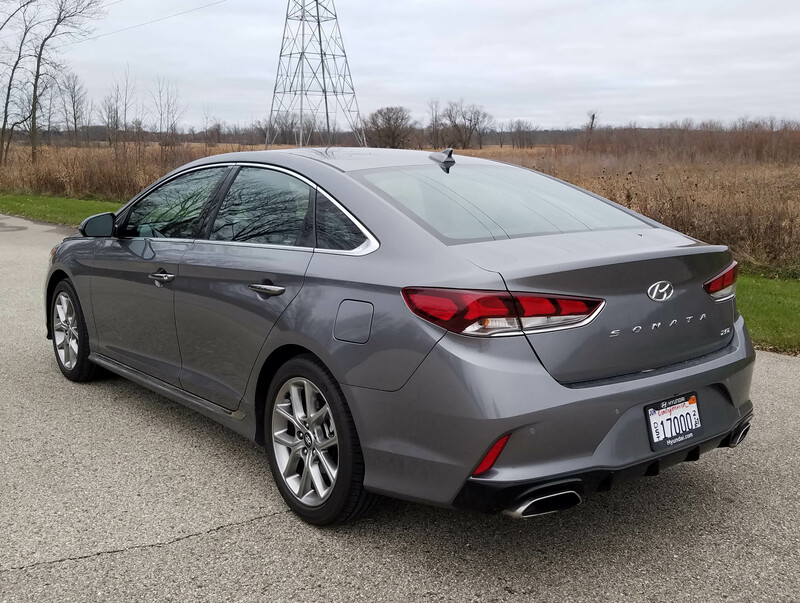 Gone is the buzzy engine noise of past Sonatas and I credit at least some of that to the new 8-speed automatic with Shiftronic features, which allows the driver to shift manually or via paddle shifters. But left to its own devices the 8-speed shifts smoothly and works well with the engine to keep it from sounding stressed. The only downside was a bit of torque steer when accelerating heavily from a standing start. I even chirped the tires a bit. 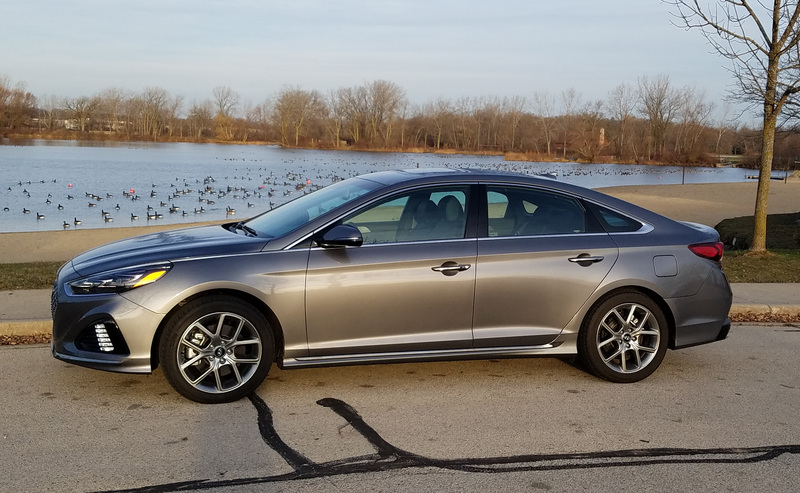 Ride is well-controlled and on the firm side, but not as stiff as it has been in the Sport model of the earlier Sonata. Hyundai has revised the suspension to firm it, but reduce the effect of bumps on passengers. This time railroad tracks did not punish passengers and even our most hideous crumbling cement streets provided only a jostle, not a spine-tingler. Handling was good with decent steering wheel feedback for a mid-size sedan. Naturally that was increased in Sport mode for a firm, heavy wheel, but was pleasant in the remaining modes. Braking was fine too. 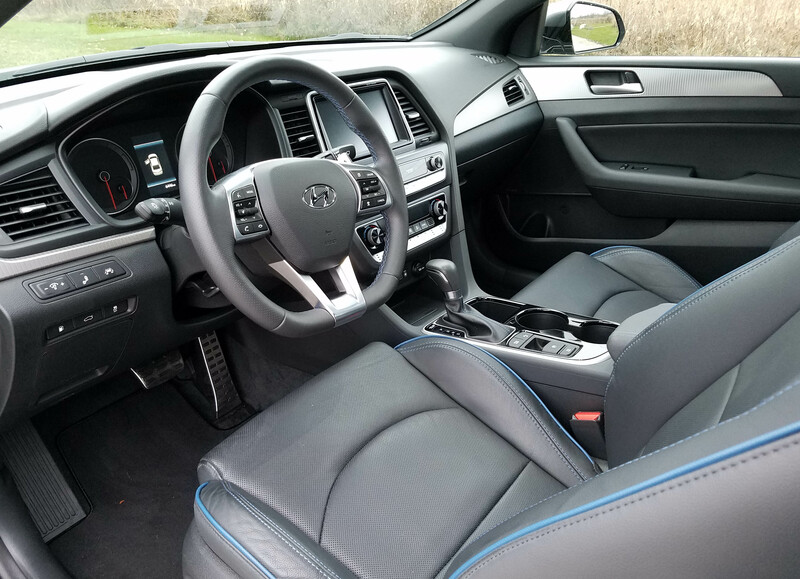 Inside, the cockpit is quiet in the Sonata. Not at luxury car levels, but equal to most mid-size sedans. Hyundai continues with its string of excellent dash designs. 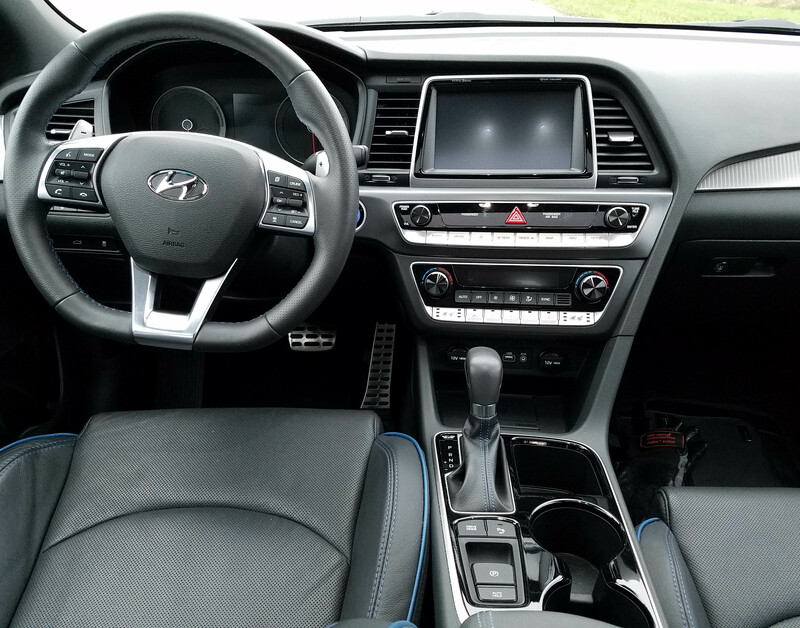 The Sonata has a clean one with large 7-inch display screen atop the dash and large well-marked control buttons and knobs spread wide below that, including climate controls. Sonata has separate heat setting for front seat occupants. Another bonus is blue-lit dash buttons and knobs that are easy to see at night and not as visually jarring as other colors. Why all car-makers don’t use blue is beyond me. Other pluses include heated and cooled front seats and a heated steering wheel, all standard on the Limited. Also standard are power front seats that are easily adjusted, plus two memory setting for the driver’s seat. Seats are well-shaped with especially good back and side support. These would be comfortable on long trips, and there’s plenty of space in the trunk (16.3 cubic feet) for luggage on said trip. Sonata has the biggest trunk in the mid-size class. But even with that the rear seat is roomy and comfortable. Overhead is a large sunroof and below the center stack a wireless phone charger, again standard. Likewise the sedan features all the safety equipment we’re growing accustomed too. That includes blind-spot warning, smart cruise control, lane departure warning, a rearview camera with cross-traffic alert, parking sensors and dynamic headlights that bend their beams around corners as you turn the car. While I love these bending beams, do note that there is a dark spot atop the beam that sometimes gives the illusion of something running across the road as the light beams sweep around a corner. One hopes with further development such an illusion can be avoided. 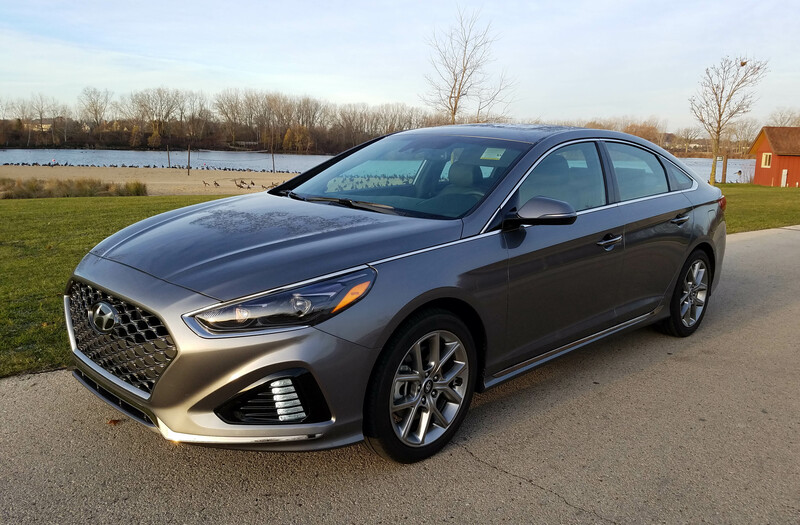 For the technoids among us, the Sonata also comes with Android Auto and Apple CarPlay systems. Plus there are two 12-volt plug-ins, a USB and auxiliary plug under the center stack. Bluetooth also is available and HomeLink is located in the rearview mirror. Gas mileage was not as strong as I’d expected. The Limited is rated at 23 mpg city and 32 highway by the EPA. I managed just 25.3 mpg in a mix of city and highway. The base SE model that features a 2.4-liter I4 with 185 horsepower is rated at 25 mpg city and 36 mpg highway. While an Eco model with 1.6-liter I4 that generates 178 horses is rated 28 mpg city and 37 mpg highway. Power is your call, but the turbo I4 would be mine. 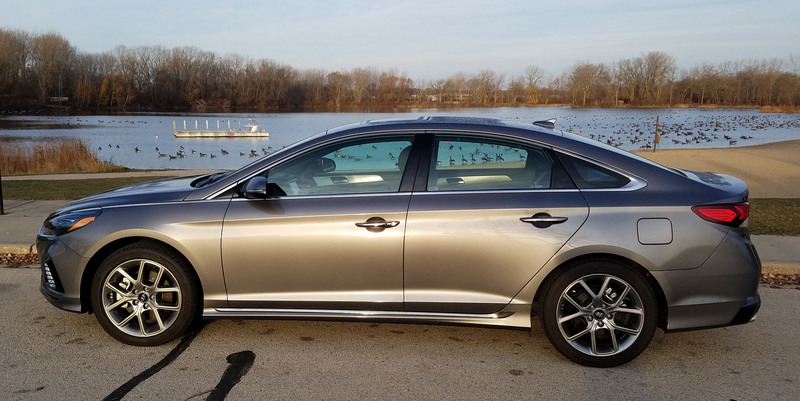 A base SE though starts at a modest $22,935 including delivery and there are 10 models in seven trim levels, depending on which engine you want. A new hybrid also is on the way. As for the tested Limited, the base price is $33,335, including delivery, and this one added just carpeted floor mats for $125 to leave the test car at $33,460. Now that’s high value for a car that will haul five efficiently and comfortably and is loaded with the tech features most folks want. Look out Camry, Honda Accord, Chevy Malibu and Ford Fusion! Hits: Sharp looking sedan with comfy ride, good handling and sporty acceleration in sport mode. High value, with big trunk, heated seats and steering wheel, sunroof, 2-memory seats, plus rear-view camera, blind-spot warning, wireless phone charger, blue-lit dash buttons and big screen. Misses: Torque steering under heavy acceleration. Moderate mpg.